$40.00 $50.00 As Low As $1.60 ea. 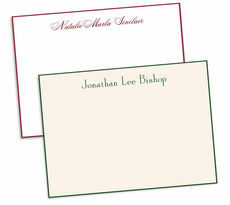 These heavyweight sage bordered correspondence flat cards make a sophisticated impression for business or personal correspondence. Ivory or white stock, 6.25" x 4.5". 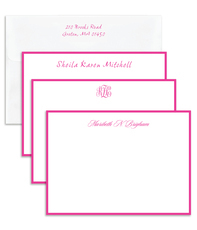 Imprinted in your choice of raised ink. You select typestyle. Return address available, additional charge. 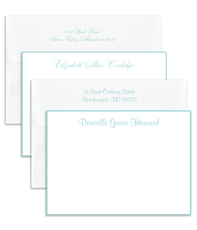 Lettering and layout formats only as shown on this set of 25 notes and envelopes. 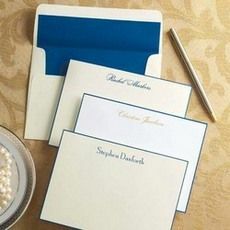 This stationery is bordered by hand. Border, ink, and lining colors may vary somewhat from each other.